I'm not overly excited about this look. I don't have too many yellows and the ones that I do have I just wasn't feeling them tonight. My new Cameo Colour Lacquer polishes came in today, one of the colors being this buttery/butterscotch looking polish called "Everything's Dancing". 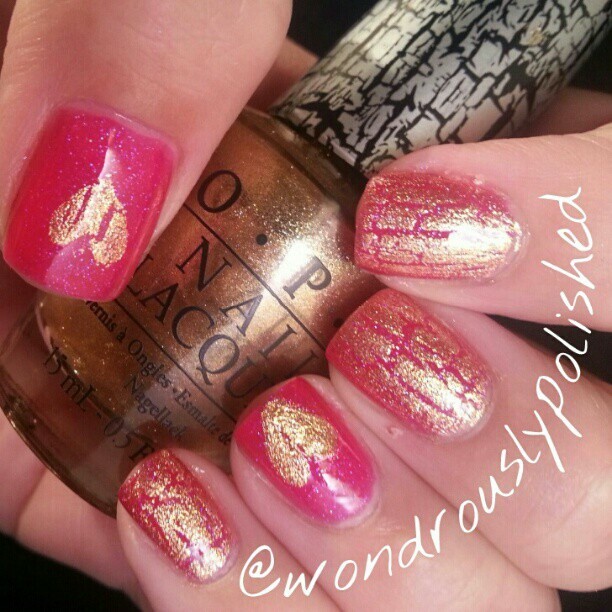 I was a little bummed that it was so difficult to get the chunkier copper glitter out, but this still works. A England Tristam & Saint George. 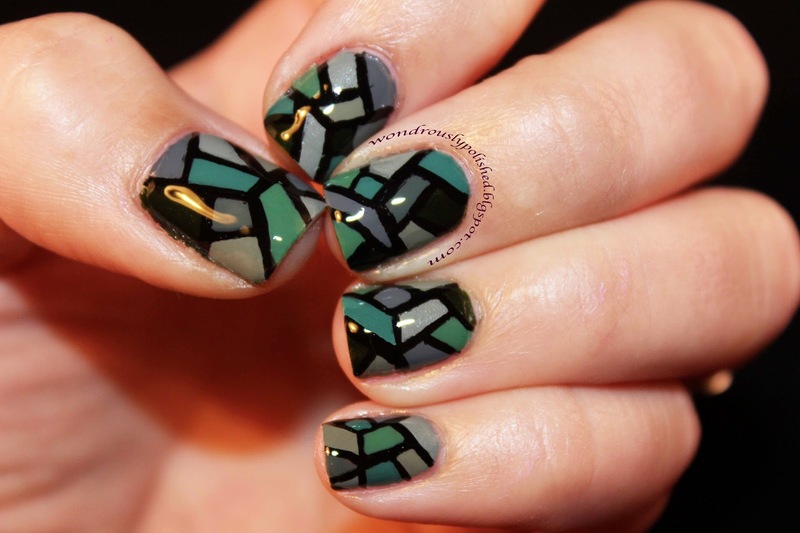 To say these polishes are gorgeous would be the understatement of the week...no year...actually century? I patiently waited for these polishes to arrive from A England's Thank You promotion and had a few stressful days in there where I thought I wasn't going to get these beauties at all. Apparently, Royal Mail (England's postal service) made a change a few days ago stating they they would no longer allow international shipping of nail polish...because it's a fire hazard to the plane. Erm, I'm pretty positive I've brought polish into my carry on as well as countless other women (or men) who had nail polish in their luggage. Seems a bit ridiculous to me, but oh well. Anyway, A England informed all of their customers of this change several days ago and I was fearful that my polishes were going to be stuck or destroyed until yesterday afternoon when they were happily waiting in my mailbox after their tumultuous journey! 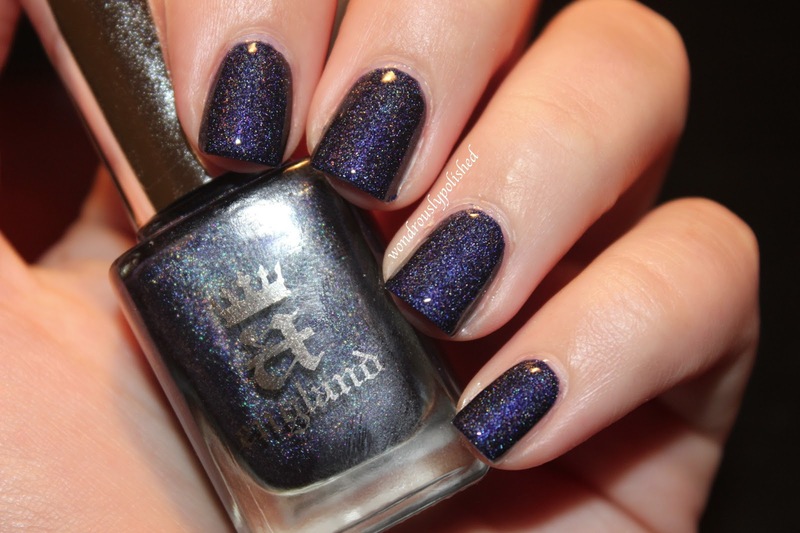 Up first is Tristam, a holographic midnight blue that makes me swoon. It's so incredible! Knock Knock! Who's there!? Banana!...err Orange. Sorry. I surprised myself today by actually keeping up with this 31 Day Nail Challenge. But you might be thinking, "Lindsey, it's only day 2, that's not that difficult to keep on track for yet..." Well, that may be true, but for me that's pretty good! I have such a hard time keeping up with things so I'm happy to report that I have completed my second mani for this challenge within two days! Yay! First up for this challenge is Red Nails! Well, red isn't really my go to color, at least not anymore. I used to wear a lot of red (as in, I only really owned red and pink polishes...I had no idea what I was missing!!) but lately I've been wearing cooler tones instead. When my collection first expanded a few months ago, I got rid of a lot of my old polishes that were no longer useable or no longer my taste. 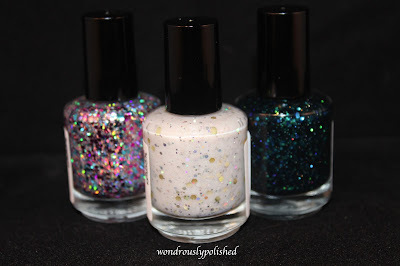 For instance, for whatever reason I was REALLY into shimmer polishes for what appears to be several years since that is the only kind of polish I bought. Now a days I tend to stay away from those if I can. I'm not sure what I was thinking in buying all of those, but then again, I had some weird bangs when I was younger and I'm not sure what I was thinking then either (why, mother, why would you let me do that!?) Funny how tastes change that way! Okay, that was an odd tangent. Here are my Red Nails! It turned into a sort of basket weave/brick wall sort of look. Oddly enough, I actually liked how these looked more without a top coat on because each stroke I had made with the brush was much more defined. Okay, so I used to have this challenge listed in my tabs, but I completely failed at ever doing anything off of this challenge list. 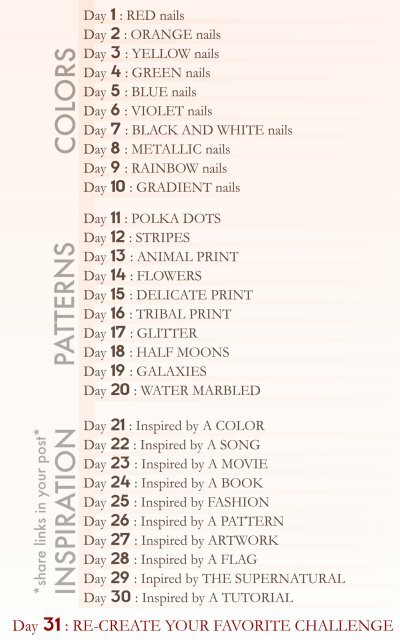 I've decided to go for it again, though instead of completing one mani a day, I'm probably going to take my good sweet time completing these. Anyway, here is the challenge list! This design kept popping up in my head and for whatever reason I kept nudging it away to do something else. I finally gave into it and frankly, I don't know what took me so long to actually do it. This is probably one of my more intricate designs and I am really proud of how they turned out. This whole look probably took me around 2 hours to complete which I know is more than most people want to commit to doing their nails, but I am in love with it. I've been asked to do a tutorial for it and if there is any more interest I'll see if I can put something together. You're going to need 4 different colors for this, as well as a small brush capable of intricate detail work. You'll also want a surface to dap out your colors onto (your palette), as well as some acetone handy for easy brush cleaning. 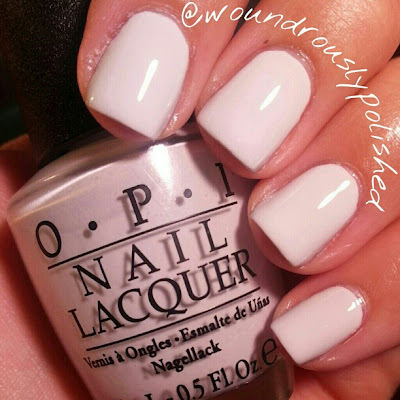 After applying your favorite base coat, start with with step 1. Anyway! I find all of the Valentine's Day products and themes to be adorable and I miss the days of making a "mailbox" for your desk in elementary school and seeing if maybe, just maybe, the boy(s) you secretly like gave you an extra special Valentine sometime during the day. 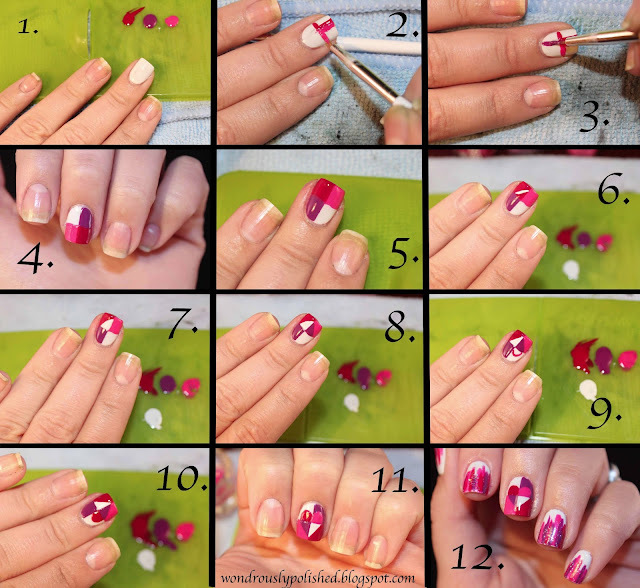 I wanted to create something fun as Valentines got closer and since there are currently a few nail art challenges/contests going around on Reddit and Instagram that have a Valentine's Day and I couldn't resist coming up with something to enter in them. I really, really, REALLY love how this turned out! 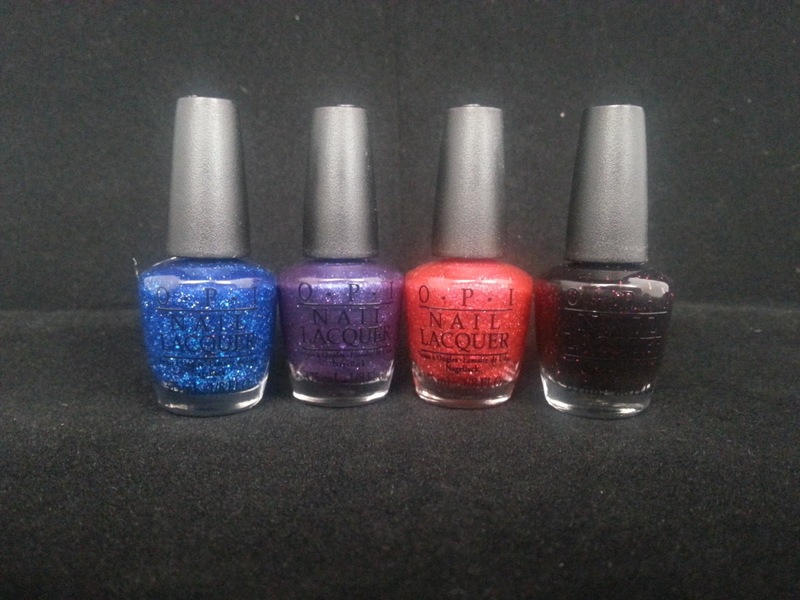 OPI's Liquid Sand Collection and a battery charger for me! I have been a bad blogger this week. I've been so worn out this week or busy with other random aspects of my life that I haven't gotten around to posting what I've been working on. I'm changing that now! 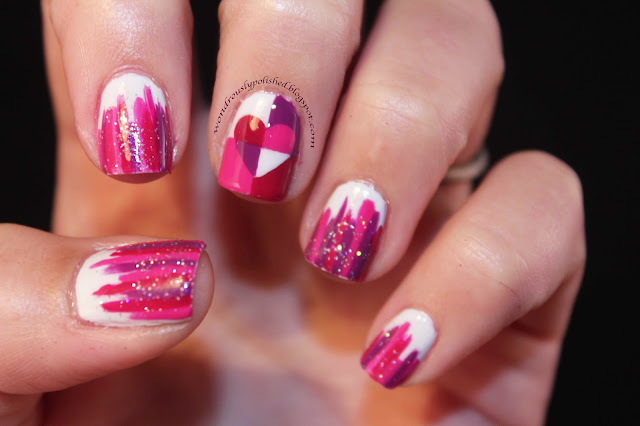 A gradient and a fun pattern! Good news! I finally ordered a new battery charger for my camera and I'm so excited to hopefully have my baby up and running again. Somewhere along my path to nail polish hoarding I acquired some "Caviar Beads" for nail art. They've been sitting in my kit since I got them over two months ago and I've contemplated using them a few times but never got around to it. I finally decided to change that and just go for it the other night, so this mani is the result of that. The beads were surprisingly easy to work with and didn't stick out on my nail as much as I was expecting. The problem with these, however, is the fact that I'm a very tactile person. I like to touch and pick at things and little plastic balls stuck on my nail are a pickers dream. Needless to say, these only lasted about a day before I could resist the urge to pick them off. I'm borrowing the explanations from Ashley because I had no idea but was flattered all the same that she thought of me! :) First, the Liebster Award! Apparently it's German and means sweetest, kindest, nicest, dearest, beloved and lovely and is awarded to bloggers with fewer than 200 followers as a way to recognize blogs you like and for discovering new blogs. As part of the nomination, we're supposed to answer 11 questions created by Ashley, as well as nominate other blogs and create new questions of my own. 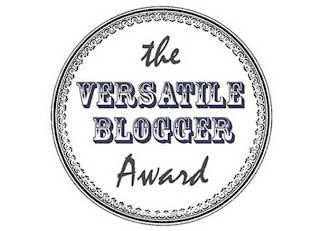 The Versatile Blogger Award is similar recognition award. 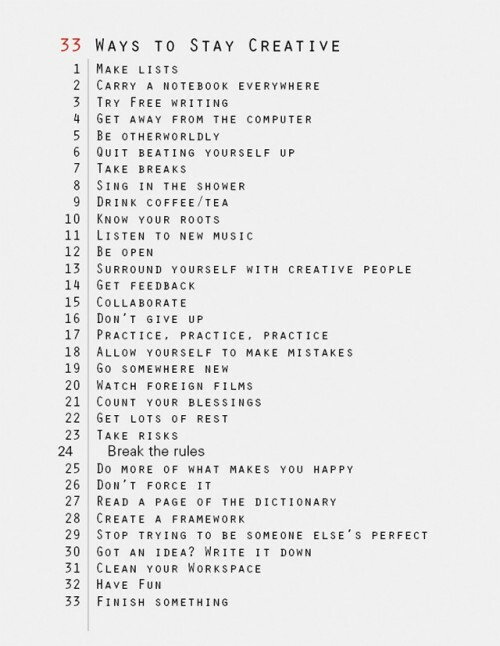 33 Ways to Stay Creative. I recently came across this list and I love all of these! I just started carrying a Levenger notebook that my Mom got me for my graduation and I must say that it has made things easier. I'm trying to write down any random thought I tell myself I'll remember because I inevitably always forget it. I've also stated jotting down nail design ideas if something strikes me. It's minimizing a little bit of stress for me and that's all I can ask for! Anyway, I had to use it again and here is the result :) I deviated a bit from my original plan with these, but I still like them. 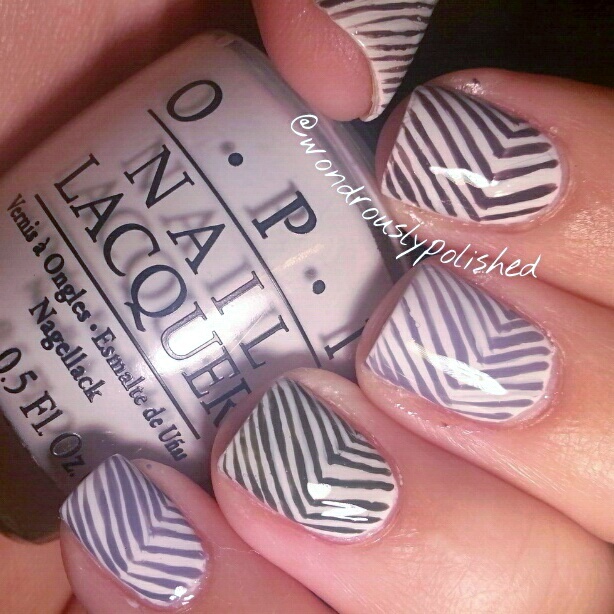 This were quick and simple with the aide of my trusty striping brush. So after my polishing binge last night, I ended up with Kieko on all of my nails and decided to spend a few extra minutes to make something quick on my middle fingers. I got asked by a few people on Instagram how I did this design so I decided to put together a quick little pictorial to share how easy it can be for you to have it as well! Yesterday, I welcomed 5 new babies into my home! That's right, my Zoya's came. YEEEEEEE! I would love to be in a career that I love and enjoy most of the time. I don't want to dread going to work. I would love to be living closer to my family. Currently I'm 4 hours away and it's tough not having my support group nearby. I've also got a tumblr going where I throw all the things I would eventually love to have in my future home, places I want to travel, and just pretty things to see, collect, and do. I hope in 10 years I will have done, seen, accomplished some of those things! Do you know what my cell phone camera and a potato have in common? They both same the same quality photos!...and I'm only slightly exaggerating! With my move a few months ago I somehow managed to misplace the battery charger for my Canon and I am so sad! I suppose I should be thankful that the two fully charged batteries that I did have lasted as long as they did, but I'm really not looking forward to buying a new charger (especially since the old one will turn up soon after). In the meantime, I'm going to search for a new camera app that will hopefully make better use of the alleged 8 megapixel camera that my phone has. 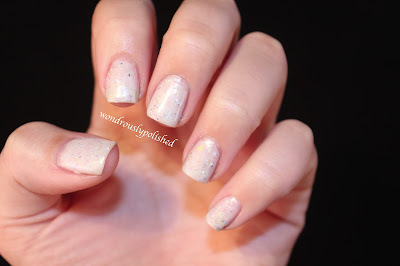 The past few manis I did I've only taken photos with my phone, so bear with me on the quality and lack of pictures. I'm going to throw them all into this post and hopefully I'll have my camera up and running again soon! I had to use 3 coats to get the opaqueness I wanted and there was a little bit of an issue with streaking, but those were both easily managed. I find the longer I wait between each coat the better but for this mani, inspiration struck at about 12:30 am...so naturally I rushed through each top coat...only to have o take more time to fix some goopiness. I need to remember to take my time and do it right the first time. Anyway! 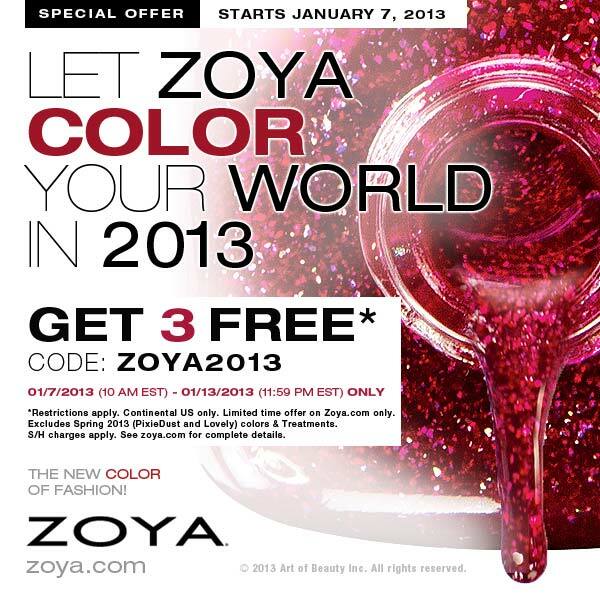 My point was that if you're waiting or that big deal to grab some Zoya's now is that time! 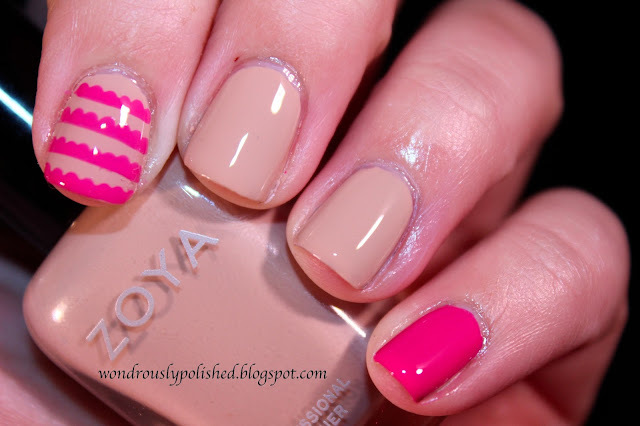 I'm continuing with the nail art challenge for January and I'm going to consider this my Pastel challenge. Maybe that's a stretch, but this is where my inspiration went tonight :) And onto the look! Where to begin??! 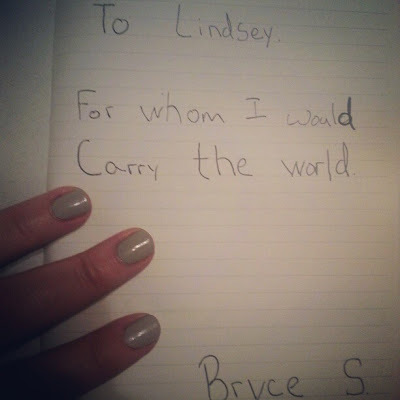 I've been with my boyfriend, Bryce, for 7 years and as I was recently told by someone, our relationship is a 2nd grader! At 22, I've been with him for a third of my life...sounds a bit ridiculous, maybe, but hey, if it ain't broke, don't fix it! I can't believe that 7 years has gone by already! As with any couple we've had our ups and downs, but at the end of the day, I still like AND love that crazy/silly/awkward boy who can always make me laugh and is without a doubt my best friend in the entire world. The two of us are actually high school sweethearts, which always seems to freak people out because finding the love of your life when you're 15 years old doesn't happen very often. Somehow the awkward friendship/attraction that began in study hall my freshman year led to an awkward first date a year later where we saw Zorro 2 (and yes, it was Zorrible...). Somehow that led to our one, two, five, seven year anniversary. Somehow we made it through all the madness, heartache, jealously, and loneliness that goes with leaving for college, getting new jobs, meeting new people and feeling left out. Somehow we figured out how to grow as a couple, but also as individuals (so important!!). Somehow I've learned to deal with his messiness and eating noises and he with my craziness and nagging (I am a girlfriend after all). Somehow we've made it work. Because we wanted to make it work and because somehow we just always sort of knew we were supposed to be together. The gal behind the nails. 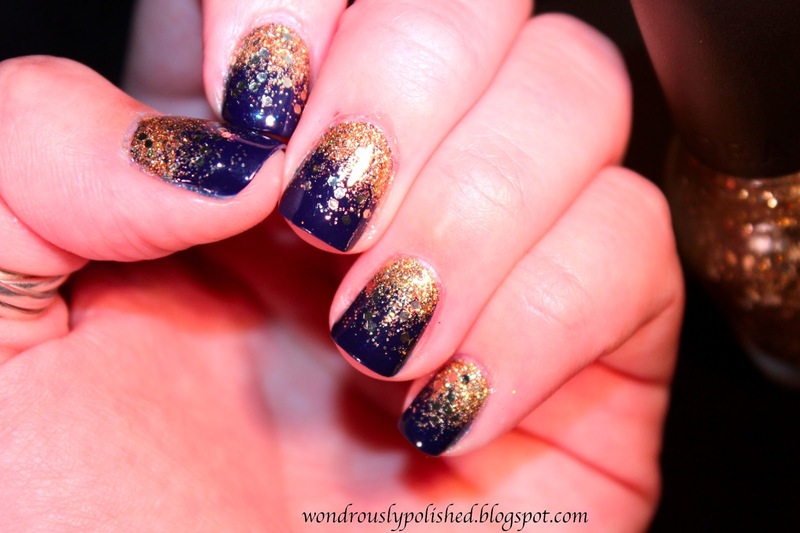 Today's nail art challenge is Sparkles! I'm really loving this look and it's super simple to create. 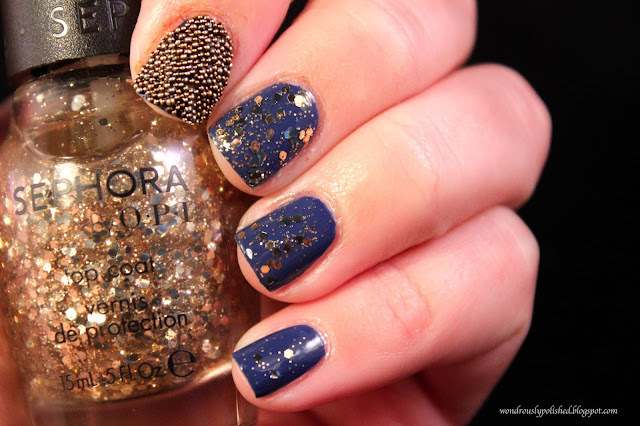 The base color is Butter LONDON's Royal Navy and the gradient is made with China Glaze's I Herd that and the chunky glitter is Sephora by OPI's Only Gold for Me top coat. 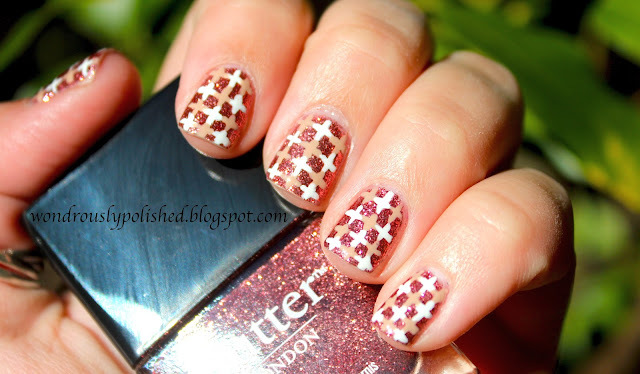 Butter LONDON's Rosie Lee with a quick pattern. Last month Good Morning America had a great deal on Butter LONDON's holiday 3-piece sets (6 polishes for $36!!) so of course I couldn't say no. I mean, come on, those poor polishes were all alone out in the big wide world and I just gave them a home! I'm so excited to work my way through using all of them and to share them all! For this look, I used Butter LONDON's Rosie Lee paired with Milani's White on the Spot and Zoya's Avery (which I also just got and I love it!). 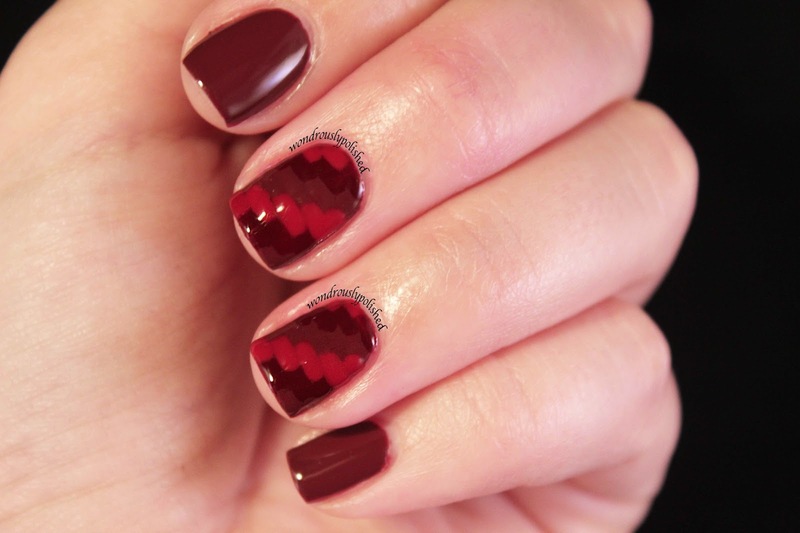 This is a pretty simple mani and once you get the hang of it, you can get it done fairly quickly.